In addition to these topics that are largely focused on City Noor, there are many other references in passing, comparing another dish somewhere else, offering it as a suggestion, a wealth of information indicating the high esteem in which a number of posters hold the restaurant. But as with so many restaurants, posts die down as the newness of discovery wears off. Places get forgotten, lost in the shadows of any new Semiramis that happens to pop up. And I'm as guilty as any, what with Semiramis being a wonderful restaurant in its own right, and a bit closer to my house. But City Noor Kebab deserves better, and I hope this nomination spurs renewed interest in a wonderful place that stands out, even on such an outstanding stretch of restaurants. More posts, more visits. As for the food, most talked about has been the splendid fava bean falafel. It's never disappointed me. But there is much, much more. The breadth of their offerings and the obvious care in the cooking make this place really special. And as an added bonus, City Noor is also a wonderful meat market just a few doors north of the restaurant. You know, City Noor is pretty good. I had some rather good mensef the last time I was there, and the food is generally well above average. What I found funny, though, was that when Beth and I walked in on our most recent visit, the woman behind the counter (edit: it was Maysoun, one of the owners) immediately changed the channel from something middle eastern (but not Al Jazeera, I don't think. if it was, it was an entertainment program) to CMT, Country Music Television. I felt kind of, well, judged. At best it seems she assumed that I'd prefer country music and at worst that I'd be offended by or distrustful of a place that had their tv tuned to an arabic-language station. I'm sure I'll be back, but maybe not so eagerly. They didn't do the switch-the-channel thing last time I was there, and hopefully they won't next time. I'd be kind of disappointed if they did. I was at City Noor months ago when a group of older, affluent, perhaps suburbanites came in asking "is this the place that was on Check Please?" Rather than answer their question directly, we assured them that they could get a great meal, made some suggestions, when we left they were enjoying their food. As to the tv aspect, in the same way that one might feel judged by a switched station, a proprietor might simply be trying to not be judged by what people see on the tv when they arrive. Many small ethnic restaurants are alternately busy and very quiet, and the staff catches up on the home town news when they have a chance. You might not have thought it was Al-Jazeera, but someone else might. To feel slighted by such an action is also a way of declaring individual enlightenment. Unfortunately, these are troubled times. Others might not be so enlightened, and to denigrate the proprietors is also denying them a way to protect what is, basically, a fragile business enterprise with a very high rate of failure. Judge them on the food and service when you're next making a decision about where to eat in that neighborhood. gleam wrote: You know, City Noor is pretty good. I had some rather good mensef the last time I was there, and the food is generally well above average. It's too bad your first experience at City Noor left a bad taste in your mouth--at least the food left a good one. I must say, however, that it's hard for me to find much off-putting or offensive or discomforting about the situation as you describe it. The cold stare in some Balkan social clubs, that I understand. But changing the TV channel seems far less problematic to me than, say, withholding certain dishes or menus because you're afraid the gringoes will order them and not like them. Did you get any bad vibe from Maysoun, or any cold shoulder, or were you in any way mistreated, or did you feel that your business was undervalued? I admit to speaking from a bias of having regular, very enjoyable, friendly, and pleasant interactions with her, but I find it very difficult to believe that her changing the channel (assuming that it was related to your entrance) was anything more than an attempt at gentle hospitality, such that this example increases my affection for the place rather than lessens it. The complicated social web of interactions that manifests itself daily in a diverse city such as this is much more easily navigated, I find, by assuming good intention and enjoying the occasional resultant cultural misstep. Judging by your posts, gleam, I suspect you share this view--I'm not quite sure I understand what set this instance apart. If it was being judged a fan of CMT, of course, I understand that's an offense many north of the Mason-Dixon line can hardly abide, and in that case my curiosity is sated. Were you wearing your cowboy boots? It wasn't my first visit, it was either my second or third, and I suspect it will not be my last. I've enjoyed the food each time, the service (aside from the weirdness) was fine on both visits as well. I didn't leave particularly offended, mostly just amused and, to a larger extent, confused. I've walked into restaurants before and been had the place fall silent, but this was somehow more subtle. Sorry if I came across as offended. I was very slightly offended, but, again, mostly amused. And more than anything it wasn't the changing the channel to something, say, in english that amused me. It was the specific choice (or random chance) of it being the country music channel. I would have enjoyed the foreign language programming more! I had my first meal at City Noor last Tuesday, as it happens, and had no intention of posting on it, since there was so much already here. But it was an excellent meal, well prepared and presented quite nicely at a rock bottom price for the delights we ate. While we were eating they turned the TV on to what appeared to be MTV-Arabic , quite loudly. We asked them to turn it down a bit. Ed, it must be you. A fine neighborhood place indeed. I am also glad that my resolve to sample each and every nominee has made such great progress that I am now sampling them before they are nominated. And no, I was not eating with Aaron, tho I am always happy to. Since we moved last fall we get to Albany Park less often than we used to do and so we've only been to City Noor a couple of times over the past half year or so. All our meals there have been good to very good or excellent and we appreciate the fact that they have some less common offerings on their regular menu and specials-rotation. I wish their shop and restaurant were in my neighbourhood. dicksond wrote: While we were eating they turned the TV on to what appeared to be MTV-Arabic , quite loudly. We asked them to turn it down a bit. I really do think they were mostly just being accommodating. Someone just needs to tell them country music rarely is At least, I would assume, for the average guest of City Noor. gleam wrote: Someone just needs to tell them country music rarely is At least, I would assume, for the average guest of City Noor. gleam wrote: And more than anything it wasn't the changing the channel to something, say, in english that amused me. It was the specific choice (or random chance) of it being the country music channel. I would have enjoyed the foreign language programming more! I'm guessing if Maysoun knew she, in even the slightest fashion, offended you she would be quite distraught. I'm guessing it was pure happenstance, maybe she had seen that particular show 50-times, maybe she simply felt a little bit Country at the moment. I realize you are in no way slamming City Noor, but I, somehow, feel compelled to point out I've never had anything but pleasant interaction with either Maysoun or Sam, in fact, I've been twice in the last 3 or so weeks for lunch. A few weeks ago, in the company of Melissa, Thor and Mike G, I had City Noor's Mansef for the first time. I'm a fan of Mansef, but, for luck of the draw, had not been to City Noor on a day it was in the specials rotation. City Noor's Mansef was terrific, equally as delicious, though in a subtlety different fashion, i.e. less tart, less soupy when served, as Steve's Shish Kabab . Maysoun said she makes the stock, for the soupy/tart yogurt broth, from beef, lamb and goat to give it a well rounded flavor. In addition to most everything I've tried at City Noor, I'm partial to the Fava Bean Falafel. City Noor's Torchi seems, similar to giardiniera in Italian Beef stands, to change composition on a weekly basis. Always good, sometimes more to my taste than others. This day it was particularly good as there was an abundance of hot peppers. The pickles picked up a mild heat from the hot peppers. The only small problem was Thor seemed disinclined to share the El Yucateco. 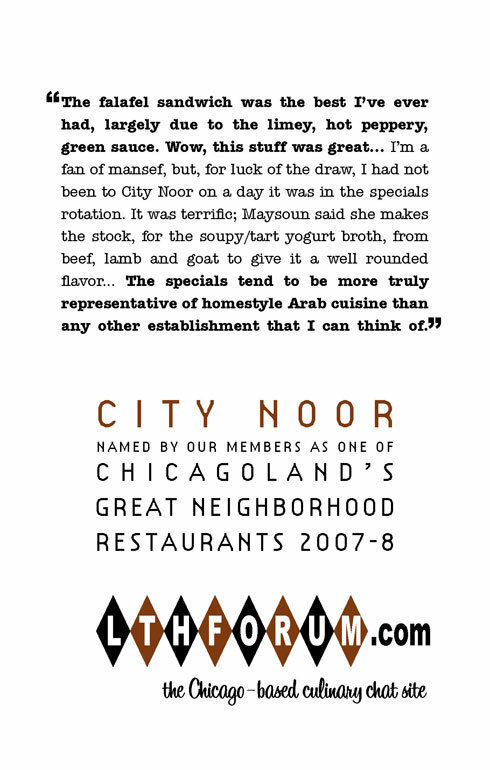 In reference to Aaron's Great Neighborhood Restaurants nomination of City Noor, I enthusiastically agree City Noor is deserving.